In those 100 days, I've done 126 releases of 52 different dists. 28 of the 52 were existing CPAN dists that I've either adopted or got co-maint on, and in all cases fixed at least some (usually all) of the outstanding bugs. Almost all of the 28 were selected because they're dists used by at least one other dist on CPAN. Only 5 of the 52 dists were neocpanisms by me. 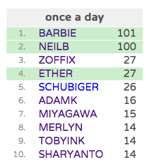 One of those was the result of working with BARBIE (BackPAN-Index-Create); one came from a discussion with PJCJ at the QA Hackathon (CPAN-Releases-Latest); one was suggested to me by SBURKE when I adopted some of his modules (Lingua-EN-Fractions); one came out of BOOK pointing out that I needed to sort out the attributes for my PAUSE:: modules (MooX-Role-CachedURL). I previously wrote about this madness on day 28, and separately described my todo list when I adopt a module. Having to do a release every day has pushed me to fix some bugs that I'd been avoiding, and also prompted me to look at my existing dists and ask "how can I improve them?". But to release every day, you really need a good number of dists, and the easiest way to do that is to adopt! Working on modules written by a wide range of authors opens your eyes, and challenges some of the ruts you may be stuck in. My coding style has definitely evolved in various small ways over the last 3+ months. There are lots of dists on CPAN that have easy-to-fix bugs outstanding. I've found that emailing authors "hey, can I fix (some of) your bugs and make your dist CPANTS-clean?" is an effective way to kick-start contributing to CPAN. Why not have a look at the adoption list and give it a go? If you've got a dist you'd like me to adopt, drop me a line — BARBIE hasn't given up yet!